Green Building Store has long been a proponent of leak free siphon flush toilets because we are aware that valve flush mechanisms can leak water down the back of the toilet cistern once the valve seal on the toilet fails. In this guest blog, Sharon Russell-Verma from SaveWater South East outlines recent research on the growing awareness of the ‘Leaky Loos’ phenomenon and puts forward some suggestions for reducing water wastage from leaky loos. Despite the fact that leaky loos are a common occurrence, there is some confusion over what exactly a leaky loo is! A leaking toilet (leaky loo) most often refers to clean water running from the cistern into the pan. However, in some (thankfully infrequent) circumstances a toilet can leak from the U-bend and this leak would be sewage. In 2015, the Leaky Loos Phase II * study (Ricardo, 2015) found that approximately 4.1% of toilets investigated were found to be leaking. Furthermore, it is estimated that every year in the UK, 397 mega litres of clean water is wasted by leaking toilets. This enough water to fill Bewl reservoir in Kent four and a half times. The same study found that modern properties (post 2000) are more likely to have a leaking toilet – 81% of leaking toilets investigated had a flush valve mechanism, whereas only 58% of toilets that were not leaking had flush valves. This suggests that the higher leakage rates witnessed in newer properties in the study may have been driven by the changes to the Water Supply (Water Fittings) Regulations which were introduced in 1999. In other words, the introduction of dual flush mechanisms/toilets designed to help reduce water use, can in some cases greatly increase water use. 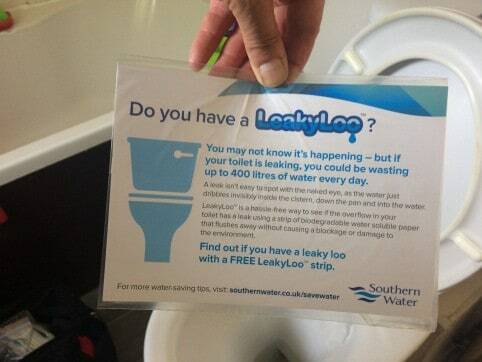 SaveWater South East is on a mission to rid the country of leaky loos one toilet at a time. In 2017 we commissioned YouGov to carry out a survey on leaky loos to help get a real understanding of what people believed and understood about leaking toilets. 38% would think that a toilet is leaking both clean water and sewage. The survey also revealed that many people believed a leak would come from the base of the toilet, a crack in the toilet or from behind the toilet. 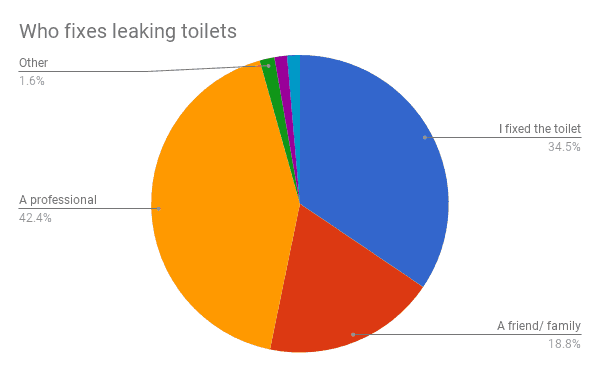 53% correctly identified that a leaky loo leaked from cistern inside the toilet. Data collected by Thames Water has estimated that on average a leaking toilet can waste 400 litres per day, that’s the equivalent of 5 bathtubs every day or is like having two extra people living in your home! These comments (above) imply that there is misunderstanding in what the term ‘leaky loo” really means and that some respondents may believe that a leaking toilet leaks sewage or a combination of sewage and clean water. Hence, there is need for better communication and awareness raising around the term leaky loos. Of those surveyed 54% of people said they had not had a leaky loo at home. For those (35%) that had had a leak loo, 59 % said they could see the toilet leaking whilst 28% said they could hear it. The Leaky Loo Phase II study has suggested that a leak needs to develop to around 300 litres per day before the customer recognises there is an issue either as it is audible, it becomes more visible, or through higher bills. Our study found that 37% of those reporting a leaky loo said the toilet was leaking constantly. 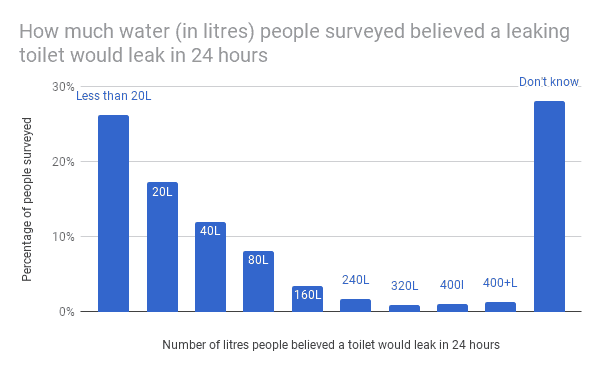 Moreover, it found that 49% of those with a leaking toilet said that it was dual flush toilet that was leaking compared with 47% who said the leaking toilet in question was not a dual flush toilet. Interestingly this is at odds with previous research carried out (Ricardo, 2015) which suggests that dual flush toilets are more likely to leak (81% in their study). However, the research methodologies in the studies differ and this may explain the divergence in the results. The 2015 study found that the most common single cause for leaking toilets is flush valve seal degradation. Surprisingly, our research found that 60% of those surveyed said they would get a leaky loo fixed within one day. Again this is may have been influenced by the belief that a leaking toilet leaks sewage or a combinations of sewage and clean water. Finally, the majority of people would get professional help to fix a leaking toilet, whilst 34.5% would fixed it themselves. . Figure 2: Who fixes leaking toilets? There is a need to better engage with people and share knowledge, such as fixing a leaking toilet can help save lots of water and money too (if they are on a meter). Furthermore, with thousands of new homes needed across the South East, an area designated by the Environment Agency as ‘water-stressed’, it is imperative that house builders (and those organisations carrying out retrofits) use WRAS approved products to ensure that leaky loos become a thing of the past. To avoid the problem of leaky loos in the first place, consider choosing water saving siphon flush WCs like our water efficient ES4 WC, which are inherently leak-free.